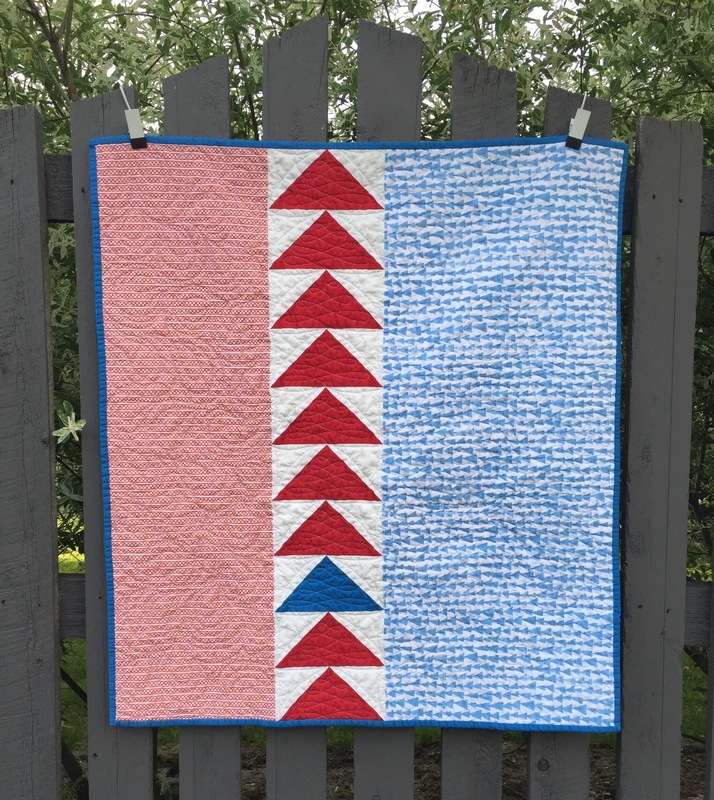 Today I am sharing with you my Flying Geese Baby Quilt. I love it when I find bits and pieces around my sewing room that I can use for a quick finish! I found these flying geese units while scrounging for something else. My only regret is that I have one left over. I would have used it but then I wouldn’t have had enough of the fabric on the sides. Such a dilemma! I had fun with the quilting. It is all freehand work. I think the ribbon candy design in the geese looks a bit like little trees. Big clam shells in the red. I didn’t want the quilting too tight because I wanted the quilt to stay soft. I call the quilting in the blue area topographic map. You just have to be careful not to quilt yourself into a corner with this design! Here are a few pics after washing. 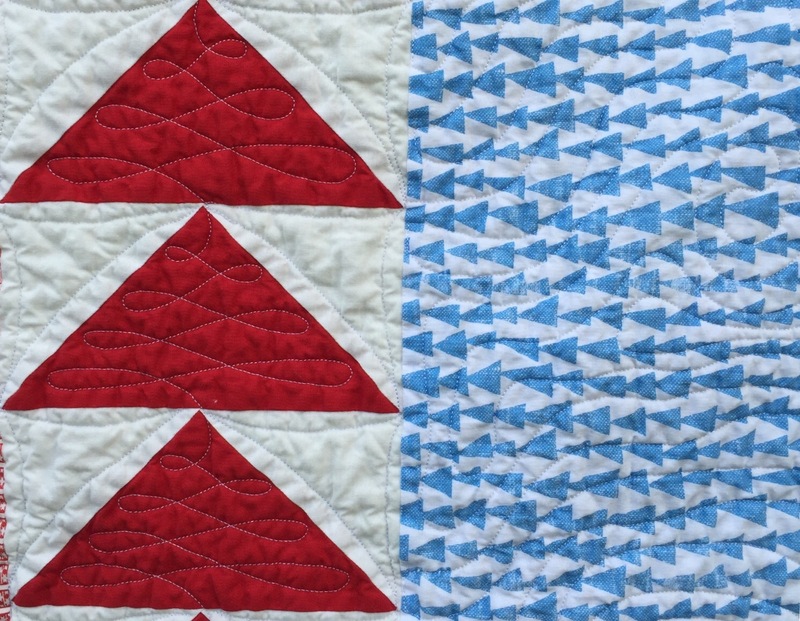 This entry was posted in Baby Quilts, Finishes, Uncategorized. Bookmark the permalink. Very cute, nice finish! Love the bold graphic look of this and the limited colors. 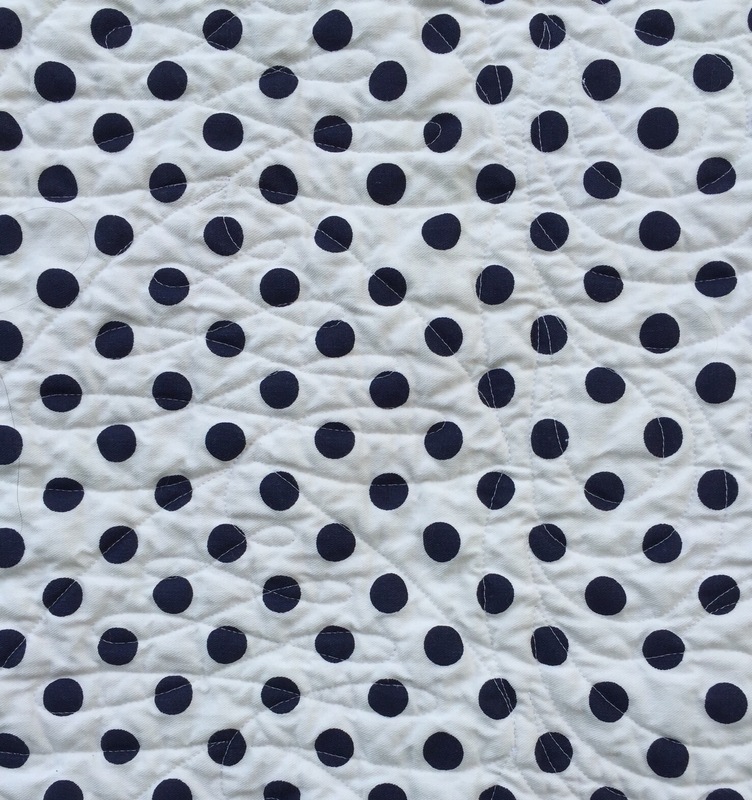 Love the topo quilting! What a fun quilt! I call these spontaneous construction – lol. do share at Michelle’s Let’s Make Baby Quilts. 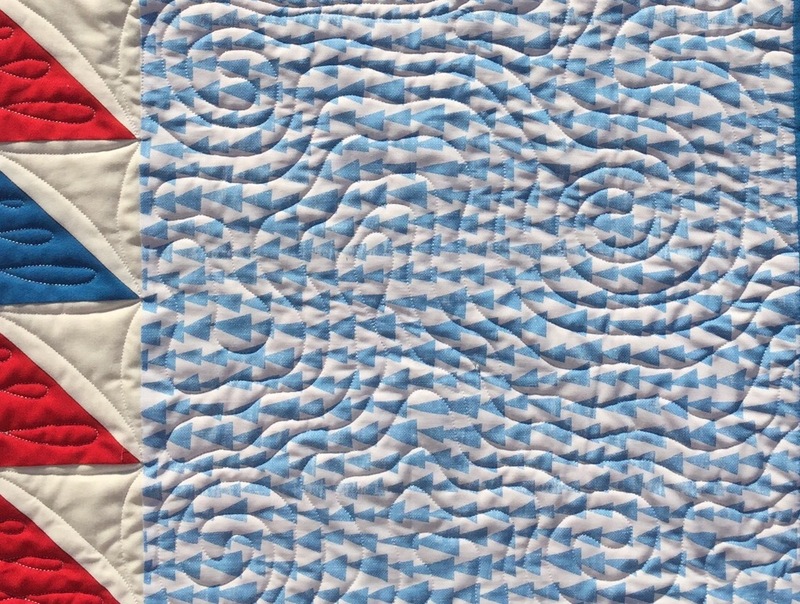 I love how the quilting rounds out the flying geese. Cute! I have a box of left over blocks and parts of blocks. 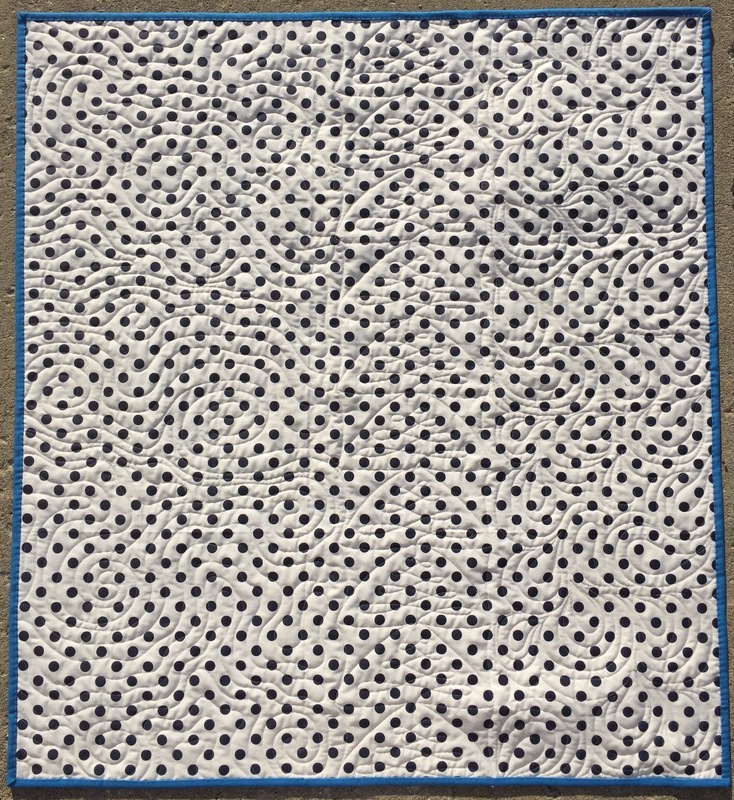 The parts department – from Gwen Marston – and at various times when I’m making scrappy quilts, I find units there I can use. I can also make entire quilts, really scrappy ones, from left-over blocks and pieces I find in that box. Naturally the vast majority of the blocks in the box are from my own projects, but there are also blocks made by others. At quilt retreats, I’ve discovered blocks in the trash and rescued them for my parts department. They may have come out the wrong size or the maker may have decided she didn’t like the color combination after all? And not everybody else saves extra blocks. Great finish! 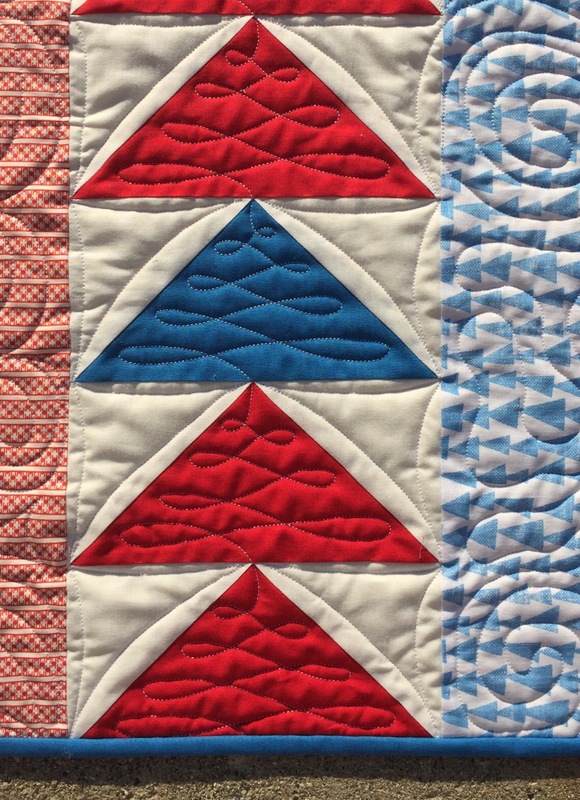 Love the quilting, and I really like the idea a couple of commenters had, to use that leftover FG block for a label! What a great quilt! And it’s a bonus that it went together so quickly. Love the quilting, especially in the geese. Lovely! 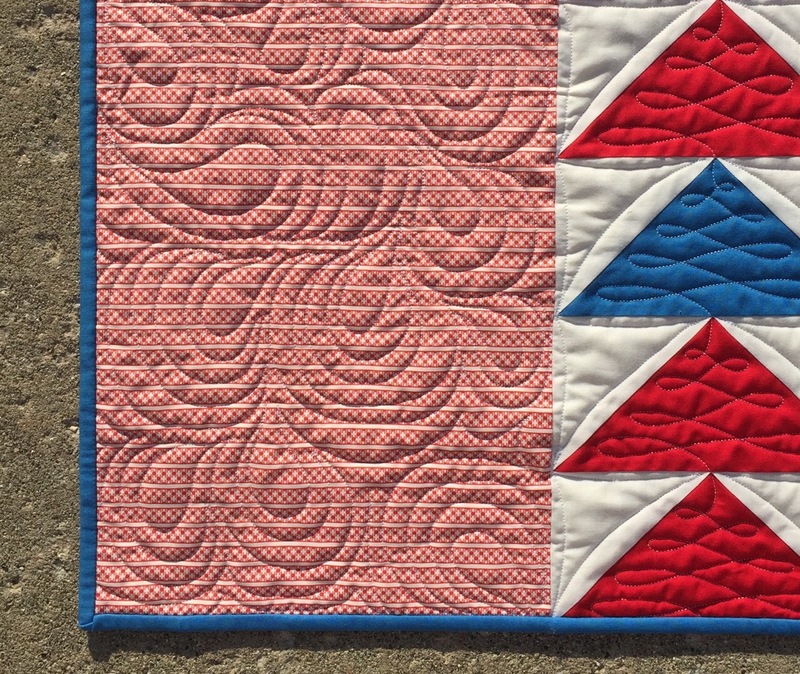 Your freehand quilting is simply wonderful!! You’re so talented, Katy. It’s always such a pleasure to follow your work. Well, I think Cecelia and Beth have beat me to it…my first thought too was label! Love all of your creative quilting on it.. It looks like you managed to keep it soft and cuddly, and baby will love it. I like Cecelia’s suggestion of using the last FG for a label.